When Steve Jobs died of pancreatic cancer in 2011, the whole world mourned the loss of the man who brought us the personal computer and the magical triplets that reside in our pockets or under our pillows: the iPod, the iPhone and the iPad. 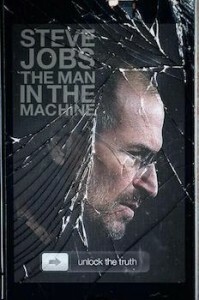 But, according to the many people who were interviewed for this doc, Jobs was not a particularly lovable man. He could be ruthless, selfish and unfair. He was a man of complex contrasts, “a monk with Zen-like focus but no empathy” who fancied himself to be enlightened and asked to be canonized as a monk. He was one of the wealthiest men in America but paid only $500 a month in child support for his daughter; when he returned to Apple after being pushed out in the 80s, he ended all philanthropic activities (unlike his counterpart at Microsoft, Bill Gates); his factories polluted rivers in China; he arranged for backdating of stock options to increase the income of key employees (including himself); and he created offshore companies in Ireland to reduce the company’s tax bill (nothing illegal about that, but the filmmaker suggests it’s unethical or improper for Apple not to pay “their fair share”). 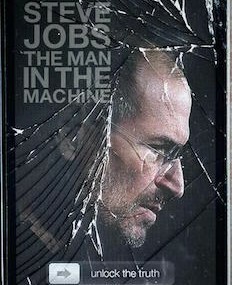 Jobs wanted to change the world, and he did. At one point the narrator asks cynically, “Is creating a product that makes buckets of money for its shareholders enough to change the world?” I would answer emphatically, “Yes!” but not because of the money. Everything we do is different now, because of the magic box we carry in our pockets, embed in our Google Glasses, and wear on our watches. Even getting around town is easier today—it was less than ten years ago that I carried a large street map in my car and had to pull over to find my way. This week, navigating around a large and unfamiliar city, I never once got lost, because Siri told me when to turn and even how to avoid traffic. Right now I’m writing this review on my iPhone. I can look up details about the films instantly. The iPhone has indeed changed my world. “Steve Jobs: The Man in the Machine,” (directed by Alex Gibney, 127 minutes).